REVIEW OF TERRENCE MALICK'S "TREE OF LIFE"
MERCURY NEWS SERVICE MOVIE REVIEW by Zora Mindermast, special to MNS. A good friend was deeply troubled by visions appearing during his sleep while trying to watch Terrence Malick’s TREE OF LIFE, a sophomoric foray into metaphysics, ontology, cosmology, sociology and boson particle physics. He was so deeply troubled that he insisted I share his agony by watching the movie myself. This form of vicarious twaddle is often called “callousness”. 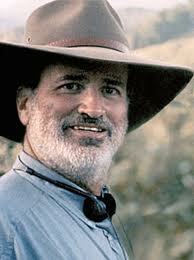 This photo of Terrence Malick would have you believe he descended from American cowboy ancestry. In truth, his father is a Lebanese Christian of Assyrian ethnicity who somehow wound up in Texas, where Terrence was born. What is the movie about? It’s about how you can remake 2001 A Space Odyssey without spacemen. It’s about Ordinary People without Chicago. It’s Jurassic Park without the John Williams score. But, its underlying message seems to be: who gives a hoot about the psychological suffering of people on earth when you have all those exploding universes circling around you in infinite space? People are microbes in a Petri dish, swimming around under a microscope with their tails flagellating like protozoa. We are the moss under the bridge – the unused pile of manure left in the winter to freeze and, hopefully, dissipate with the onset of spring. Malick’s message seems to be as uplifting as that. One would think that such a story with flash-forwards and backwards; with scenes taken straight from Kubrick’s outer space masterpiece, showing brilliantly colored palettes of nebulae and red dwarfs, playing with one another like goldfish in a Chinese brook; with dinosaurs appearing in a sudden infolding of time – a primordial jungle pungent with swamp sludge and drying crustacea – then to the present in something like Waco, Texas to commiserate with a family still grieving for the loss of a son taken from them by suicide; you would think you might get Jesse Ventura to play the lead. But no! This movie has Jessica Chastain – Brad Pitt! – and Sean Penn! It won the Palme D’Or at Cannes (which means nothing unless you believe the French are not depraved derelicts). It is considered by some quack critics to be a masterpiece. Mmmm. I forgot to tell you; at the end, Malick makes some effort to smooth out the rather fatalistic, even depressing thematic of his screenplay. You see, he has the entire family reunited with the suicide brother on some beach where an arching wooden frame of a door stands. Everyone is happy and thankful that Sean Penn was able to bring them all together through some reincarnation reminiscent, again, of Kubrick’s Universal Child returning to earth with the intimations of Kier Dullea in its cherubic face. While the family is cheerfully reconstituted, the viewer is dead asleep or struggling against it. This movie makes Sominex obsolete. This is not to say that Malick is not a gifted movie maker. His “Thin Red Line” is a masterpiece. But this movie is so close to being another SyFy Channel exclusive, made on location in Albania or the LaBrea Tar Pits, you start to wonder how these wunderkinder can keep shaking down the moguls with promises of vast profits. Michael Cimino, fresh from his blockbuster hit, “Deerhunter”, managed to snooker the suits in Hollywood into funding his titanic Oeuvre D’Enfer, “Heaven’s Gate”. But you’d think they would have learned. The performances given by Penn, Pitt, and Chastain, along with the other fine actors were more than adequate to carry the universal themes of man’s feebleness in the face of such formidable and crushing temporo-spatial phenomena. What the performances cannot do, alas, is keep this writer awake.